Presented by the Government of Burma in generous recognition of the Victoria and Albert Museum's safekeeping of the Mandalay Regalia (1886 to 1964). This gold and jewelled container once formed part of the regalia of King Thibaw, the last Burmese king (r.1878-1885). 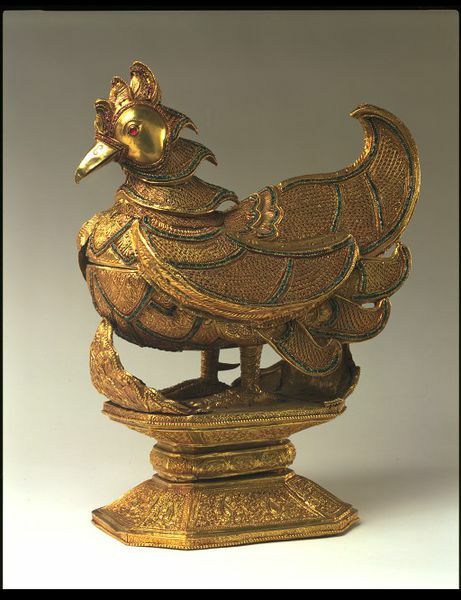 The karaweik, a mythical bird, is a symbol of longevity. The container was used at the royal palace at Mandalay as part of a betel paraphernalia set. The offering of betel--a mildly narcotic chewing quid--was an essential element of traditional Burmese society. Every household, including the royal family's, had a set of utensils for its preparation. Betel leaves, used to wrap the blend of areca-nut shavings, lime and spices, were stored in the karaweik container. 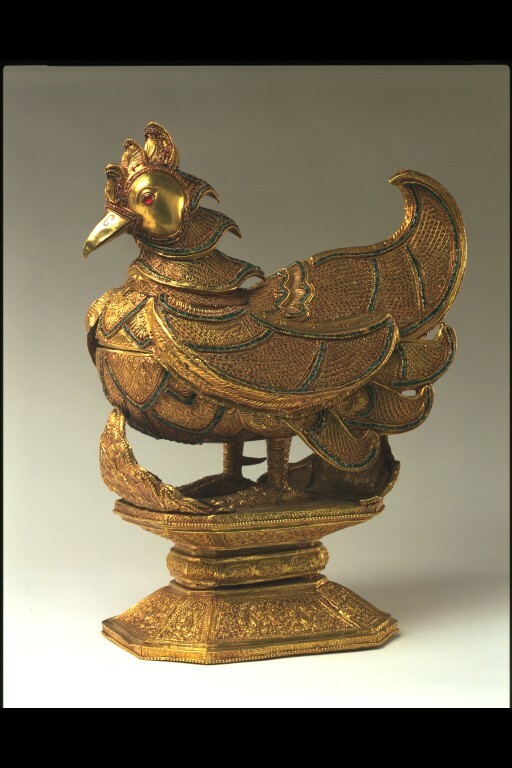 This object was given to the Museum by the Government and people of Burma in generous recognition of the Victoria and Albert Museum's safekeeping of the Burmese royal regalia from 1886 to 1964. 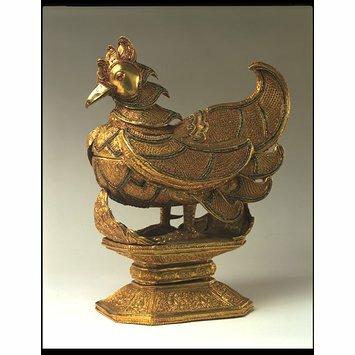 A vessel and cover on a stand, in the shape of a karaweik (a mythical Burmese bird). Chicken like in appearance with its feet, pointed beak, wealth of overlapping body feathers, curled wings and upturned tail. The waisted stand is decorated with panels of floral ornament and at each end a leaf-shaped extension with foliage motifs, curves upwards to support the body of the stand. The container formed part of the Burmese royal regalia which belonged to King Thi-baw, who was the last representative of the Burmese monarchy. The regalia was part of the material requisitioned as indemnity at the end of the third Burmese war in 1885. It was later placed under the custodianship of the Museum (IS.144 to 294-1890). It was returned to the Government of Burma in 1964 except for the Karaweik (IS.159-1890). This was given to the British Government by Ne Win at the time to be kept by the V&A as a token of friendship and goodwill. Yule, Capt (later Col. Sir) Henry.Narrative of the Mission to The Court of Ava in 1855 London: Smith, Elder, and Co., frontispiece (illustration of similar karaweik as seen in the royal regalia of King Mindon).